Elegant and durable, this 5-piece dining table set is the perfect addition to any contemporary backyard. The chairs, which are equipped with sumptuous, matching cushions, will tempt you to sink into them every day of the year, while the glass-top dining table is perfect for serving food and drink. 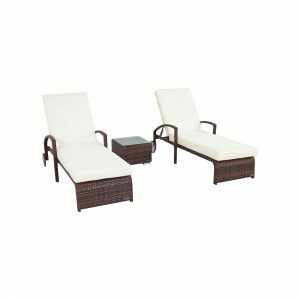 As you enjoy a family lunch by the pool on a warm afternoon, or entertain guests at an elegant soiree, know that you’ve purchased an outdoors set of exceptional quality and durability. 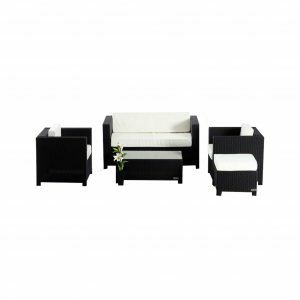 Made with flat wicker and an aluminum frame, this set is sure to breath life into your patio arrangement for many years to come.